Some of my friends think I'm crazy for leaving money on the table by not including Google ads on this site. It is true that I am a control freak, and it is the lack of control—or need to continually monitor what's going on—that gives me pause. 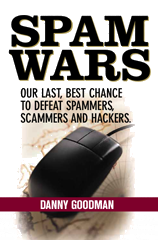 I was reading a news item at an online security magazine called SC Magazine. The article relayed findings from a security researcher about previously undisclosed not-very-nice things that recent RealPlayer 11 installations were doing behind user's backs and under their noses (a verbal M.C.Escher image). At the end of the article was a box with three Google advertisements in it. All three invited users to download RealPlayer—more specifically, "Real Player." Not one of the three links pointed to Real's site, but all three domains had "realplayer" in them. I don't know what you get when you visit those sites, and I'm not about to find out. Given the keywords that appear in my blog entries, I shudder to think what ads would appear on my site. No thanks. I'll peddle only my own fish here. Buy my book and bring me in to train your colleagues on email safety.